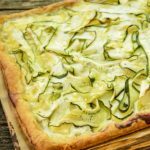 Herbed Goat Cheese and Zucchini Tart is an elegant meal that is a snap to make. It's a great way to use the bounty of fresh summer produce. Preheat the oven to 375°F with a rack in the center position. Line a sheet pan with parchment paper. Carefully unfold the puff pastry sheet on a lightly floured work surface. Use a flour-dusted rolling pin to gently roll the puff pastry into a large rectangle roughly 12 by 16 inches; it should be just smaller than your sheet pan. Carefully transfer the puff pastry to the prepared pan. Use a sharp knife to score a 3/4-inch-wide border around the puff pastry; do not cut all the way through. Use a fork to prick holes inside the border of the rectangle, poking the dough every inch or so. Place the sheet pan in the fridge or freezer to harden the pastry dough, about 20 minutes. Meanwhile, stir-mash together the ricotta and goat cheese in a small bowl until fully combined. Set aside. Trim the ends off the zucchini and, using a vegetable peeler, cut them lengthwise into long, thin strips. (Alternatively, you could use a sharp chef's knife to cut them into 1/4-inch rounds.) Place the zucchini in a large bowl and sprinkle with a pinch each of salt and pepper. Toss to distribute the seasoning. When the dough is good and chilly, place the pan back on your work surface. Spread the chese mixture evenly over the pastry, leaving the border bare. Arrange or pil the zucchini atop the cheese either haphazardly or in your favorite pattern, until the cheese is completely covered. Drizzle the olive oil over the zucchini. Bake the tart until the crust is puffed and deeply browned and the zucchini has softened and browned at the edges, 45 to 50 minutes. Allow the tart to cool slightly before cutting into squares. Serve warm or at room temperature. To thaw puff pastry, remove it from the package, keeping it wrapped in plastic, and leave it in the refrigerator overnight or on your work surface for about 30 minutes. Pastry sheets come folded up like a letter - don't try to unfold them when they're frozen or they'll tear! After the pastry has thawed, you'll be able to easily unfold it. Wrapped well in plastic, thawed pastry will keep for about 2 days in the fridge.